Ear infections, or otitis, are a common problem in dogs. Painful, itchy ears can cause a decrease in quality of life, odor, hearing loss, and behavior changes. Because there are many possible causes of ear infections, it is important to have a veterinarian evaluate the dog before starting ear medicine. Diagnosis is made by history, physical examination, and otoscopic examination. Other tests can include ear cytology, ear culture and sensitivity, blood chemistry tests, thyroid tests, and allergy tests. Left untreated, ear infections can progress to chronic changes in the ear canal, pain, deafness, and infection of the middle and inner ear. 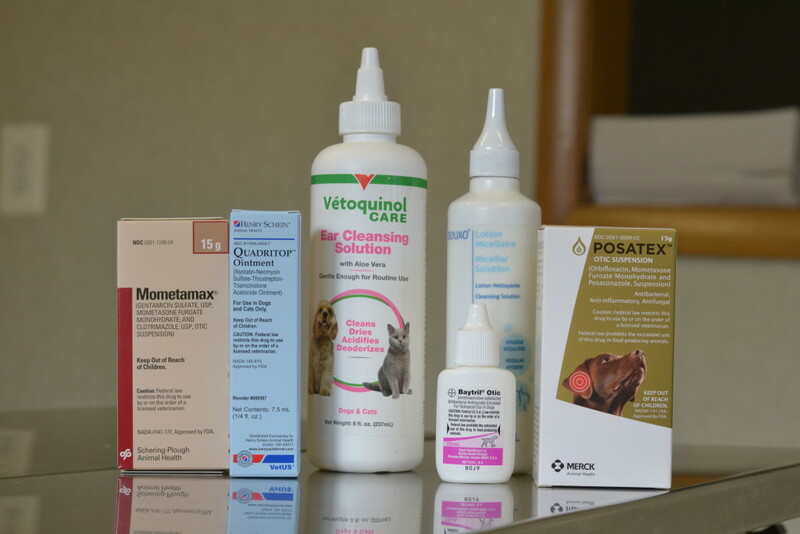 Common medications used for ear infections in dogs include Osurnia, Mometamax, Animax, Quadritop, Tresaderm, Revolution, prednisone, Apoquel, cetirizine, diphenhydramine, Simplicef, Baytril, Zeniquin, and others. For more information or if you believe your dog or cat might have an ear infection, please call us.